This example demonstrates how you can use PROC GAMPL to fit a nonparametric negative binomial model for a count data set that has overdispersions. 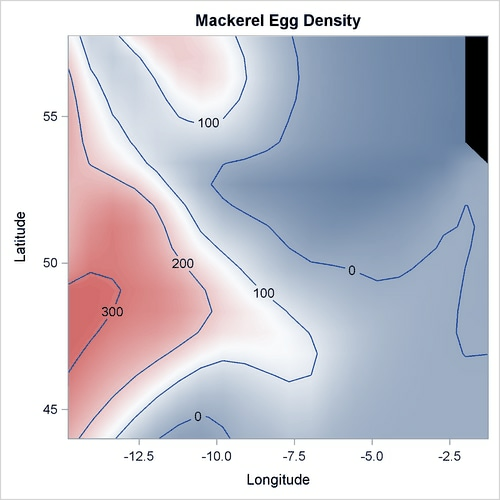 The example concerns a study of mackerel egg density. The data are a subset of the 1992 mackerel egg survey that was conducted over the Porcupine Bank west of Ireland. The survey took place in the peak spawning area. Scientists took samples by hauling a net up from deep sea to the sea surface. Then they counted the number of spawned mackerel eggs and used other geographic information to estimate the sizes and distributions of spawning stocks. The data set is used as an example in Bowman and Azzalini (1997). The following DATA step creates the data set Mackerel. This data set contains 634 observations and five variables. The response variable Egg_Count is the number of mackerel eggs that are collected from each sampling net. Longitude and Latitude are the location values in degrees east and north, respectively, of each sample station. Net_Area is the area of the sampling net in square meters. Depth records the sea bed depth in meters at the sampling location, and Distance is the distance in geographic degrees from the sample location to the continental shelf edge. This is equivalent to a Poisson regression that uses the response variable Egg_Count, an offset variable , and other covariates. Output 42.3.1 displays the mackerel egg density in the sampling area. The black hole in the upper right corner is caused by missing values in that area. 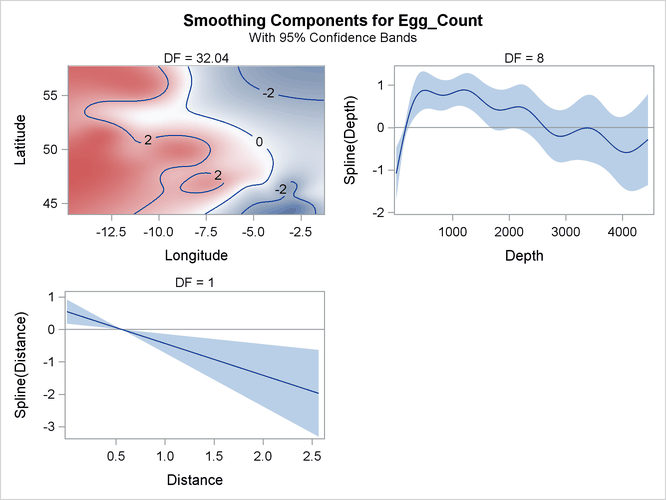 In this example, the dependent variable is the mackerel egg count, the independent variables are the geographical information about each of the sampling stations, and the offset variable is the logarithm of the sampling area. The following statements use PROC GAMPL to fit the nonparametric Poisson regression model. 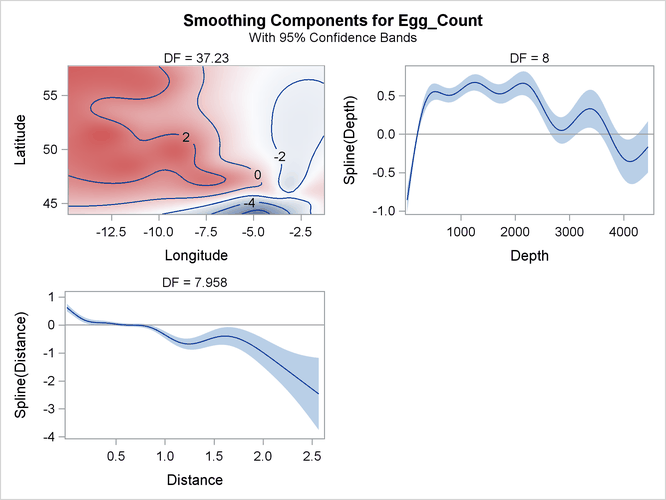 In the program, two univariate spline terms for Depth and Distance model the nonlinear dependency of egg density on them. 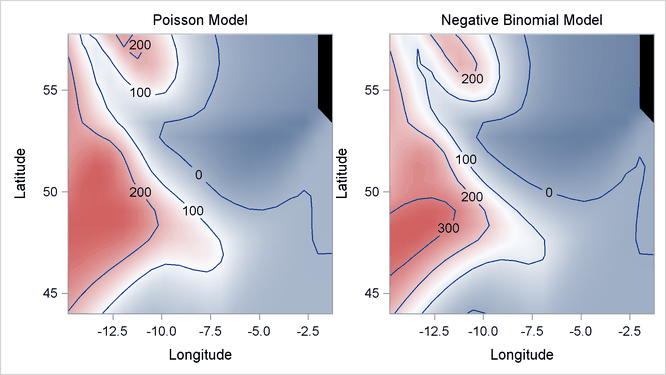 One bivariate spline term for both Longitude and Latitude models the nonlinear spatial effect. To allow more flexibility of the bivariate spline term, its maximum degrees of freedom is increased to 40. Output 42.3.2 displays the summary statistics from the Poisson model. The “Tests for Smoothing Components” table in Output 42.3.3 shows that all spline terms are significant. The smoothing component panel in Output 42.3.4 contains a contour for the spatial effect by Longitude and Latitude and two fitted univariate splines for Depth and Latitude, all demonstrating significantly nonlinear structures. Overdispersion sometimes occurs for count data. One way to measure whether the data are overdispersed is to determine whether Pearson’s chi-square divided by the error degrees of freedom is much larger than 1. You can compute that statistic by taking the sum of squares of the Pearson residuals in the MackerelOut1 data set and then dividing that sum by the error degrees of freedom that is reported in Output 42.3.2. The computed value is approximately 8, which is much larger than 1, indicating the existence of overdispersion in this data set. Output 42.3.5 displays the summary statistics from the negative binomial model. The model’s effective degrees of freedom is less than that of the Poisson model, even though the dispersion parameter costs one extra degree of freedom to fit. The values of the information criteria are also much less, indicating a better fit. The “Tests for Smoothing Components” table in Output 42.3.6 shows that all spline terms are significant. The smoothing component panel in Output 42.3.7 contains a fitted surface and curves for the three spline terms. Compared to the Poisson model, the fitted surface and curves are smoother. It is possible that the nonlinear dependency structure becomes smoother after its partial variations are accounted for by the dispersion parameter. Pearson’s chi-square divided by the error degrees of freedom for the negative binomial model is approximately 1.5, which is close to 1. This suggests that the negative binomial model explains the overdispersion in the data. Output 42.3.8 displays two fitted surfaces from the Poisson model and the negative binomial model, respectively.